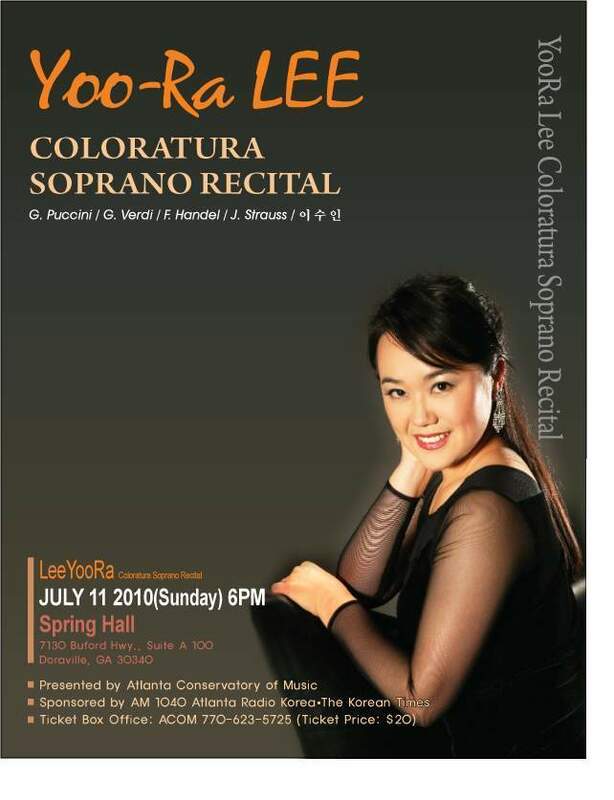 Yoo-ra Lee Recital will be presented on July 11, Sunday at the Spring Hall by Atlanta Conservatory of Music. Seoul, South Korea. In Berlin and Leipzig, Germany while she was active as a violinist. Her beautiful voice was discoverer and she was invited to study vocal arts/opera at the university of music and theatre in Leipzig, Germany. She graduated in 2006 with diploma and concert diploma. She actively participated at master classes with Julia Hamari and Siegfried Jerusalem. She is currently coached by Irngard Boas. Her first engagements Lead her to the leipzig opera house, Germany (2002and2003) and the Saxony's traveling repertory theatre Dresden Radebeul, Germany(2004-2005) while she was still studying. Since 2005 She was singing at the Dresden State Operetta. During guest engagements she performed at the stages of the theatre Bautzen. the state operae Schwerin. the theatre Dessau. the opera House Chemnitz. the theatre Gera and others. During the "Vienna Johanna Strauss concert gala" tour she was singing at several major concert halls in Germany and Switzerland. among others at tonhalle Zurich. the Residenz Munich and the Berlin Philharmonic. Her concert work took her to concert halls in Germany, Austria, Switzerland, Spain, Ukraina, and Estonia. Her next opera engagements are as Fiamerra in "Boccaccio" and as Queen of the Night in "The Magic Flute" at the Dresden State Operretta, Germany. Next concert will be at the Frauenkirche Dresden, Germany whit Bach cantata.